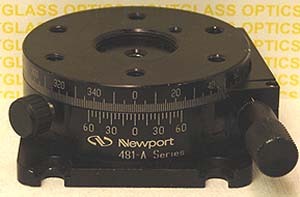 The Newport 481-A Precision Rotation Stage is a full 360 degree rotation stage, controlled by a micrometer actuator, and has a thumbscrew for locking it in place. It has a 1" Threaded aperture where optical components can be mounted. Commonly used for rotating filters, and polarizing components, as well as for positioning optical mounts.